Cody Willoughby | Troy Daily News Ralph Westfall of Casstown, who served in the United States Marine Corps from 1966-68, signs one of the boards of the veterans memorial trailer currently on display at the 2018 Miami County Fair. 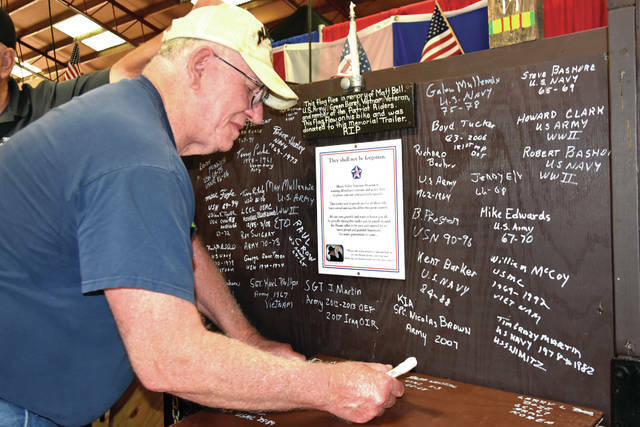 MIAMI COUNTY — Throughout the 2018 Miami County Fair, representatives of the Miami Valley Veterans Museum have invited veterans to sign their name and military history on a unique veterans memorial trailer, which has been on display at the fairgrounds throughout the week. Museum Vice President David Gawronski described the origins of the trailer, which was started by Vietnam veteran and Springfield native John Helton in 2009. Helton spent the next two years transporting the trailer to special events and locations throughout the Miami Valley, collecting signatures of veterans from every branch of the Armed Forces. As Helton collected signatures, it became his dream to show the trailer at parades. Helton passed away in 2011, roughly a month before the first scheduled parade. Though Helton’s family attempted to maintain the trailer for the next few years, financial woes led them to contacting the staff at Miami Valley Veterans Museum. The exact number of signatures has not been tallied, but Gawronski indicates the roster is easily into the thousands. With the fair continuing through Thursday, and Wednesday serving as Armed Forces Day at the fairgrounds, the museum staff hope many more veterans will come out to sign the trailer. “On Veterans Day, we anticipate getting a lot more signatures,” Gawronski exclaimed. Due to its second floor location, the staff will be unable to feature the trailer at the veterans museum, however Gawronski indicated that tentative efforts to re-locate the museum in the near future could allow space for the trailer to become a prominent fixture. “It’s going to travel around,” Gawronski said. “It’ll go to various veteran events, and it’ll be a main focus when we get into our own large building. It should be right at the front door, when you walk in, with all the extra boards mounted on the walls. For more information, visit www.miamivalleyveteransmuseum.com. https://www.tdn-net.com/wp-content/uploads/sites/21/2018/08/web1_Signature1-4.jpgCody Willoughby | Troy Daily News Ralph Westfall of Casstown, who served in the United States Marine Corps from 1966-68, signs one of the boards of the veterans memorial trailer currently on display at the 2018 Miami County Fair.